Carmen Reinhart and Kenneth Rogoff, the authors of a famous 2010 study, 'Growth in a Time of Debt' have been assailed after it was discovered that their conclusion that economic growth would falter once public debt levels reached 90% had incorporated an error in their Excel spreadsheet. A reworking of the code by Thomas Herndon, a University of Massachusetts student, and his two professors shows that growth only declines slightly instead of contracting (see The Economist chart at left). Those in the stimulus camp have been rejoicing at the debunking of Reinhart and Rogoff's flawed findings. However both the austerity and stimulus proponents have not been able to put their fingers on the real issue. Again this reflects their data-driven infatuation that has prevented them from seeing the real pattern. Actually the pattern is simple. What do you do if you're out of job? You'd do anything – beg, steal or rob – to survive but if someone is willing to lend you money, you'd surely borrow before choosing the other less well-meaning options. Similarly, if you take the analogy of the Monopoly board game, how can you make the game last longer when only one player is winning? There is surely no other way than borrowing from the winning player or from the banker. Of course, you can never repay because your borrowed money eventually ends up with the winning player. The same goes for our real life economy. In the maturity phase of a Kondratieff Wave, we have no choice other than to increase debt (chalk one up for the stimulus camp). But increasing debt doesn't revive growth, it merely buys time, delaying the inevitable contraction, now made worse by the increased debt load (chalk one up for the austerity camp). Like that of the Monopoly game, the losers do not have the slightest chance of winning. Their only hope of winning is to start a new Monopoly game (or in real life, a new Kondratieff Wave). 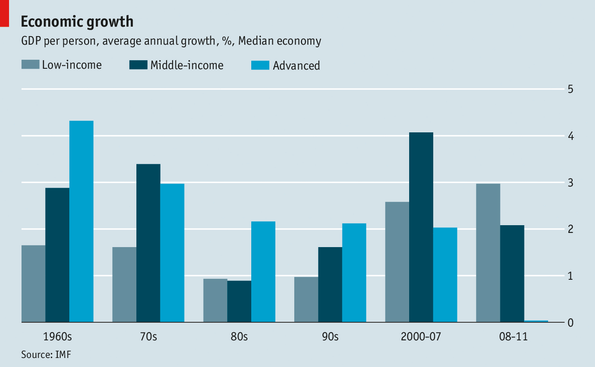 The chart below (also from The Economist) depicts the economic growth pattern for the advanced, middle-income and low-income countries. We can see that the advanced economy has finally succumbed to the inevitable decline phase of the Kondratieff Wave. Notice that the cycle for the middle-income lags that of the advanced but leads that of the low-income. So as wealth inequality rises for the advanced economy, it is falling for the low-income, for now. The final outcome would still be a rising one as the low-income eventually catches up with the rest, not in terms of GDP per capita but in terms of hitting the economic growth wall. So the main defect of Reinhart and Rogoff's argument is their confusing cause and effect; growth is not a consequence of debt but debt is a consequence of an economic super-cycle. The other critical defect in the Reinhart and Rogoff's study is that it covers only public debt whereas for the purpose of the real economy, all debt components – public, businesses, households and financials must be counted. There are times when public debt falls but total debt increases. 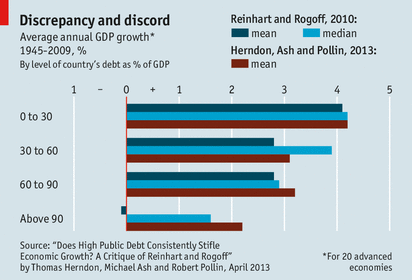 Relying solely on public debt generates a false picture on the amount of money in the economy. For two renowned Harvard professors to commit a simple Excel error, that is forgivable but for the whole economics profession's failure to see a crystal-clear pattern, that would be damning evidence of its wretched state.